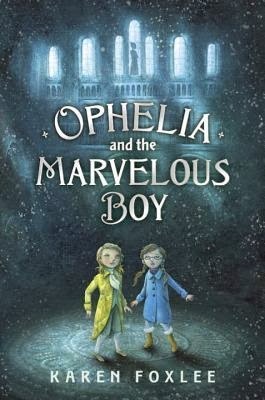 Ophelia and the Marvelous Boy by Karen Foxlee goes on sale today and is available at Amazon and Barnes and Noble. A modern-day version of The Snow Queen that attempts to blends science and fantasy while retaining the prose of a fairy tale. Ophelia, the main character, is very analytical, using science to work her way out of fantastical situations that occur after her Dad temporarily uproots her sister and her for a temp-job at a museum. I enjoyed the scientific reasoning that Ophelia used to work her way out of sticky situations. I wish there was more of it. For instance, Ophelia is constantly puffing her asthma inhaler when she's in a tight spot. Kids with asthma, who also have a good understanding of their condition, might enjoy reading about a character they can relate to - I know there's a link between asthma and anxiety, but what about the kids who don't know that or who know nothing about asthma? This book missed a teaching opportunity about a very common condition. Fast descriptions were well-delivered for the familiar elements of the real world found in the story, but this technique didn't translate well for the fantastical elements and felt sparse. I had a difficult time imagining the misery birds and the Marvelous Boy. I received a free advanced copy of this book in exchange for a review from NetGalley so this element may be changed in the final version of the book - I didn't like the Marvelous Boy or how his back-story is delivered. With Ophelia, we see what she sees but when the Marvelous Boy takes center stage, he literally tells her (and us) his back-story, which I found overly long and incredibly dull.